Today’s post is all about creating a DIY craft beer advent calendar (i.e lots of beer with a perfectly good excuse not to miss a day consuming one) and the many options available these days about beer advent calendars in general. While many people hold the view that using booze in an advent calendar is shocking or in poor taste, I will defend the craft beer choice by pointing out that beer has been an inseparable part of the Christian tradition and the life of monks for centuries. Think about Doppelbock for example, the beer style invented by German monks as a nutrient rich drink to help them stay alive through the days of lent. Or think about the Belgian Trappist monasteries and the amazing libations that emerge from them. I mean, beer is synonymous with the Christian clergy, whether you like it or not. Furthermore beer saved lives century after century when water was not fit to drink. We are all here today because someone way back in our family tree repeatedly made the wise choice to drink ale versus contaminated water. Chris and I are convinced that not only is there nothing wrong with counting the days to Christmas with craft beer but it is a glorious idea, true to history, Christian tradition and making merry. We are grateful for the gift of craft beer. Around the holidays and always. The short answer is three-fold – cost, timing and brews selection. While Chris and I totally love to part take in the craft beer advent calendar tradition ourselves (in addition to enjoying the sight of our kiddo open numbered chocolates and Lego pieces every morning) if we spent almost $250 on our calendars and another $50 for kiddo’s it begins to add up mercilessly. That is even before the biggest financial setback of the year aka the Christmas holidays gift buying frenzy has had a chance to hit us. So we turn to the DIY craft beer calendar option which allows us to have two calendars for about $100 total, on time for December 1st. And we have a say on exactly what the beer choices are for each of us, while still maintaining an element of surprise since we’d wrap each others’ and not know what beer is destined for what day. In the past few years we used the same two (decorated) partitioned Kraft cardboard boxes from purchasing empty 12 oz beer bottles for home brews, but those got quite worn out so this year I bought a few items to make new beer bottles ‘holders’. Hence this post actually. This is what I used to make two very similar, yet slightly different in appearance craft beer advent calendars (I refrained from labeling them with our names, lol). Left over decorative ribbon from making this beer can cake. I spent about $109 with tax, so less than $55 each (per craft beer advent calendar). OK, in reality, I did buy more than two bottles of some of the beer styles because we plan on using them in upcoming recipes (these days we are trying to plan ahead, imagine that:), but I am not allocating the cost of those to the calendars. So the math is good. The next step (aka assembly) is super easy. You open a beer that is not to be included in the advent calendar. 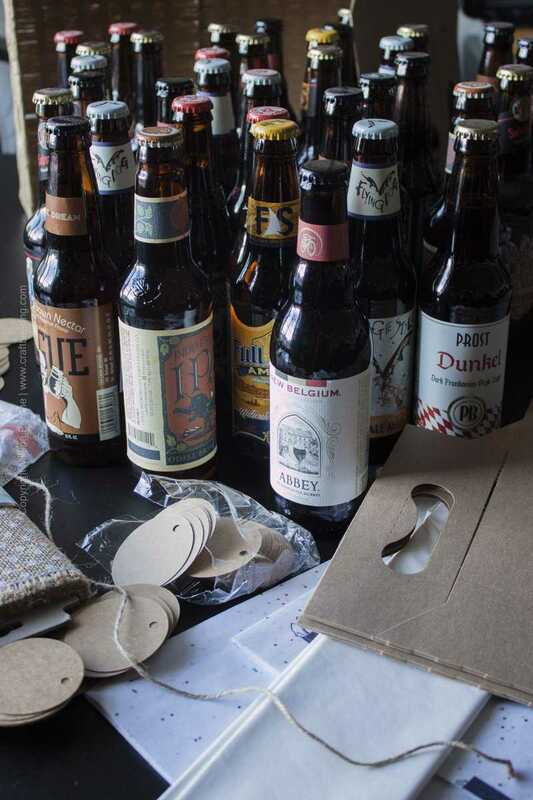 You wrap each beer bottle from the 24 you selected for the calendar in tissue paper as you happily sip on your beer. You secure the cinched section around the bottle neck with clear tape. You write the numbers from 1 to 24 on the hang tags and then patiently tie one onto each wrapped beer bottle with your twine string. 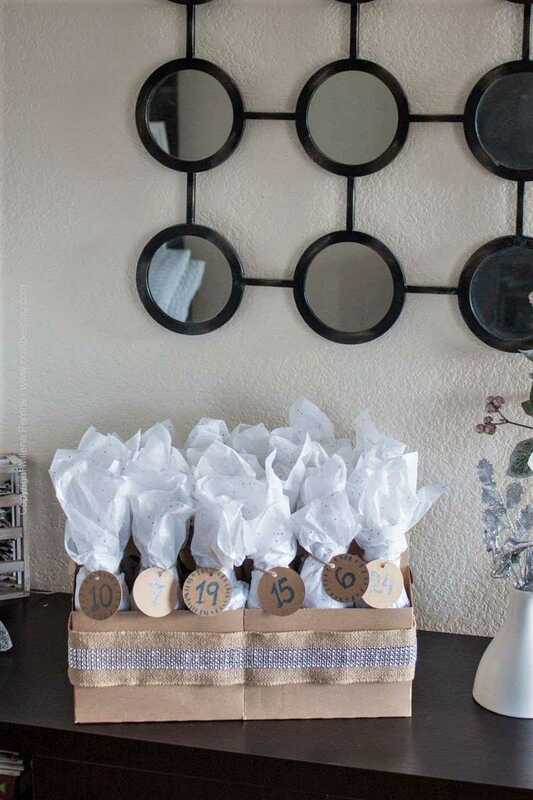 You arrange the wrapped bottles in the decorated basket or the 6-pack beer holders (for these you want to wrap a ribbon or a different decoration around the periphery of all of them stacked together and secure them to each other with clear tape). You open a second beer and congratulate yourself on a job well done. Think of all the happy times ahead as you count down the days to Christmas Day with a beer surprise each night. (Tip: if using 6-pack beer holders, do place them onto a board of some sort before you fill them with bottles and decorate their periphery. Twenty-four beer bottles are quite heavy to lift as is it, you do not want the taped 6-pack holders to come undone etc, will not be a pretty sight). In case you do want to drop the cash for a pre-made calendar (I am familiar with the powerful pull love can exercise upon one who is enchanted by a craft beer lover) check with your local craft beer cellar/store first and if you are not successful securing one, then look online. Do it well in advance. In October or early November. My personal experience purchasing the beer advent calendar online a few years back convinced me to abstain from repeating it. Who wants to start counting down after day eight? Or start complaining and feeling sorry for themselves that their order arrived late in the advent of Christmas and ruin their mood? Better to avoid such prospects. Maybe things have improved since, I hope so. There is also a middle of the road solution – you order the gorgeous pre-made ‘shell’ for the craft beer advent calendar and buy the beer at a local liquor store with a good selection. Most stores will allow you to purchase mixed 6-packs, meaning you get to select 24 completely different beers for a minimal surcharge over the base retail 6-pack price. Good times! This is an awesome solution because for the most part the purchased box can be used again and again and the person you give it to will remember your kindness year after year. Even if you didn’t buy the beer but they did it themselves because they remember how much fun the first time around was. 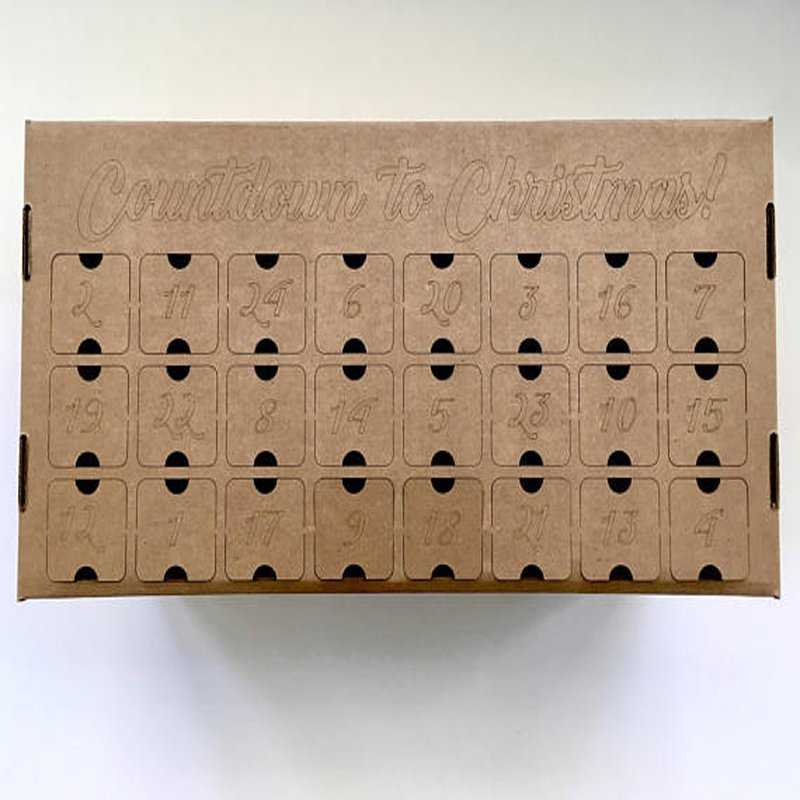 I’ve rounded up several ideas for advent beer boxes to get you going if you should choose the partially DIY craft beer advent calendar option. I actually like the design of this one:) Gender neutral and cheery. Not too colorful (I frown upon gaudily decorated anything). It is made of sturdy cardboard and can serve its purpose for several seasons. The numbers cutouts can easily be closed back down. No work required other than inserting the beer bottles. Find it here. Similar idea here with a minimalist design. Find it here. Option 3: Vintage Wooden Soda Crate I just love old fashioned soda crates, but they often have Pepsi or Coca-Cola written on them. So you’d need to spray paint over that. Instead, with this 12 slot option you’d put together two soda crates side by side. Maybe a tasteful ribbon. In reality this is a great way to do it, since lifting 24 beers in a heavy container is not an easy feat and who wants to break 24 beer bottles all at once? Full bottles at that. Find it here. 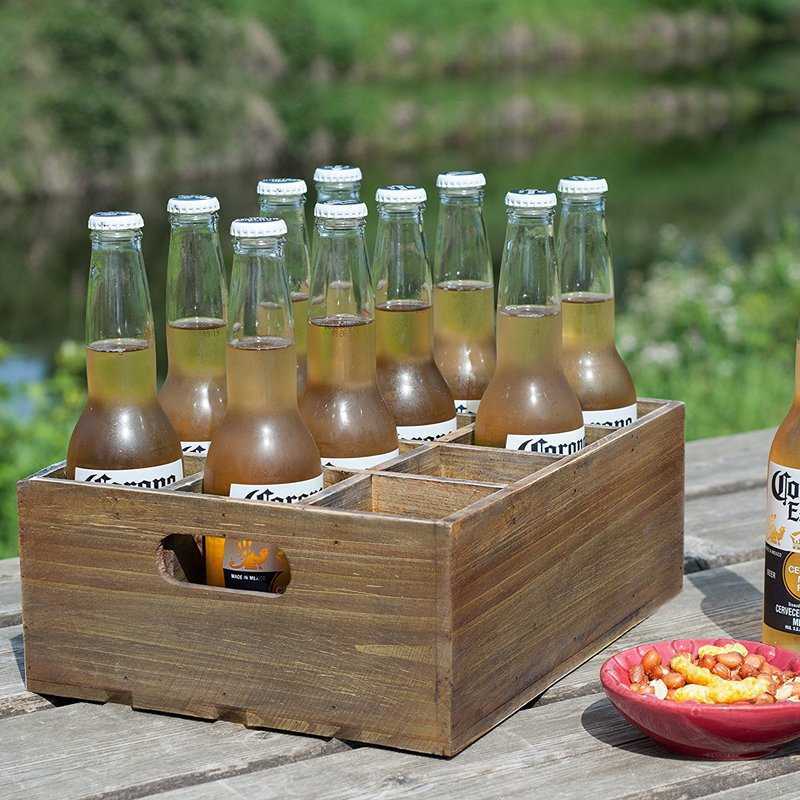 Find other craft beer gift ideas. So well said, Karrie:) Amen to beer and advent calendars! So cool you guys do it too! Pretty or not, guys don’t care that much, it is all about the beer, right? I think this is marvelous. Featuring when my party opens up tonight! I do realize that many women enjoy drinking beer, but I do believe more men are fans than us girls. Most of Christmas is geared towards feminine tastes, like glitter, sparkle, pretty plates etc. It is so marvelous to have an advent calendar of beer. Love this idea. Love this! Every year I intend to get or make a beer advent calendar for my husband, but I always forget or run out of time. 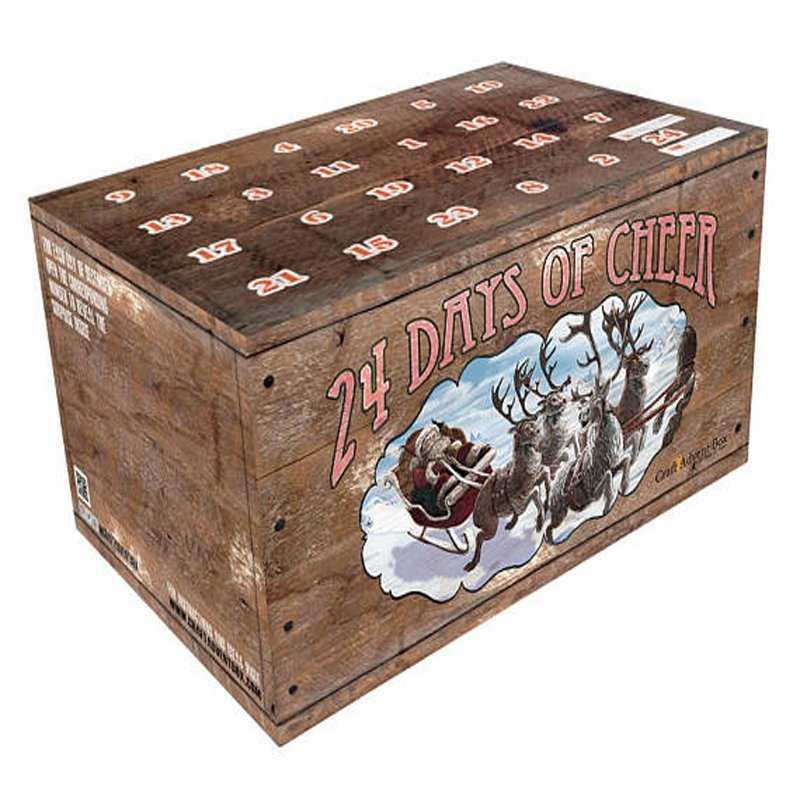 The last few years, I’ve put together a 12 days of Christmas beer box for him. He seems to enjoy having a little treat to open for the 12 days after Christmas Day! But your DIY tutorial is definite motivation for me to get my act together for December 1st this year 😉 ! Yes, beer and religion go hand in hand…as do wine and religion. Definitely a wonderful way to prepare the way for Christmas! ? Thanks so much for sharing at the #happynowlinkup! This is a great reminder that Christmas is on its way! I’m not much of an alcohol person, so this isn’t for me, but I love the idea. The Body Shop has an Advent Calendar that they sell. I might get that this year. I love this idea so much and know plenty of other people who would get super excited for this! I actually didn’t know beer calendars were a thing and that you could order them. But like anything, doing it yourself gives you more control and is cheaper too. So cool! The build up to Christmas is my favourite part! I need to make this for my Husband, he would love it. I’ve never seen or heard of one so I am loving the idea (for the first time)! So much fun! And like Kelsie said, my family’s all about the wine, too…we could get creative with that as well! OMG, yes, Annie! Wouldn’t it be so cool to make an advent calendar where every day you unwrap a bottle of wine with a piece of cheese that pairs well with it? Or a small package of nuts or dried fruit agreeable with the wine? 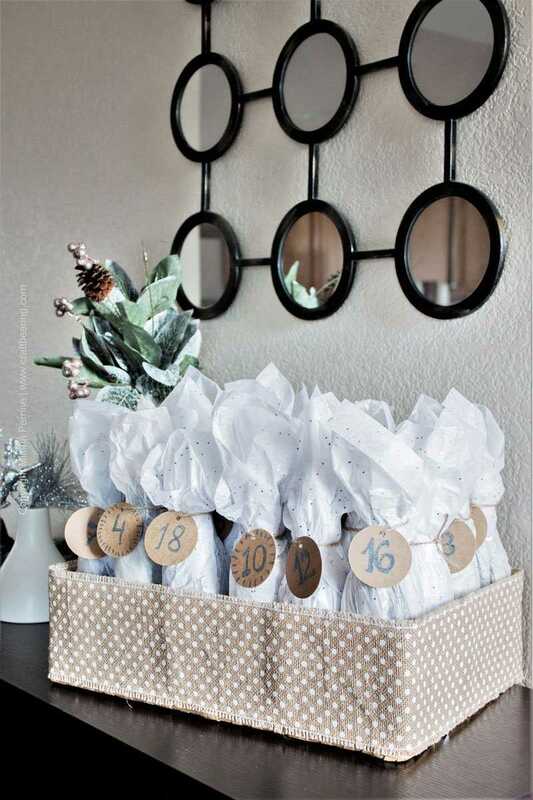 You’d need a larger family perhaps, but maybe not, if well versed in consuming two glasses of wine each this could be a perfect idea for a shared advent calendar! I absolutely love this idea 🙂 So much fun and love all the different, creative ways to do it! Such a fun idea! Hubby and I used to buy beer advent calendars and they definitely are pricey. Around here I think it was something like $180/calendar. Yikes! I remember one year we bought them and it was such a disappointment….there was, like, 3 or 4 beers that were horrible and I remember even pouring some down the drain. Shame. I would much rather make my own and fill it with beers I actually like. This would be a lovely surprise for hubby! P.S. I can’t believe Christmas is just around the corner!! Oh gosh, I hear you Dawn, sometimes it is disappointing to trust matters of personal taste to others, especially when the expectations are that you’ll love the results of what they did. We always tell each other about what gifts we want so choosing beers for each other is a no brainer:) Have a great week ahead! I absolutely loooove this idea! And I would never tell you it’s in poor taste to make a beer advent calendar. Even without beer’s historical relevance, plenty of people couldn’t survive the holidays without a little alcohol :). You should see the amount of red wine my family goes through on Christmas! Hope you had a great weekend, Milena! I knew I could count on your support Kelsie! Alcohol does help one survive the stress of the holidays. I wish they were not stressful actually. But we shall do what needs to be done:) We love making red wine sangria around Christmas…Cheers!